At this time of year, students may understandably be more focused on their own upcoming midterms than those happening Nov. 6. 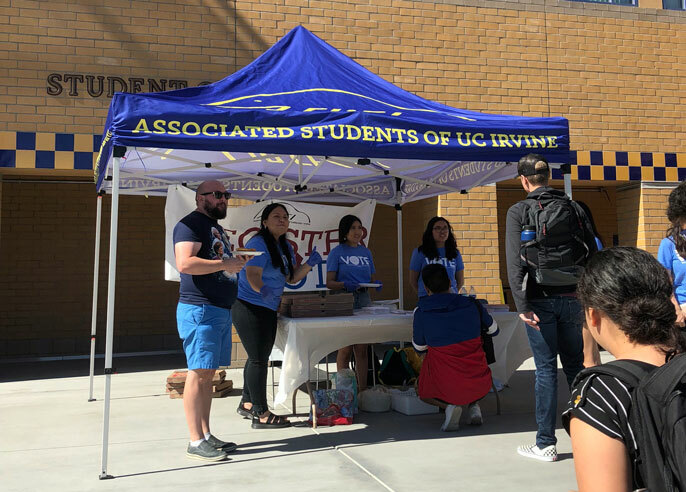 But with the Oct. 22 voter registration deadline fast approaching, UC students like Celina Avalos have been out in force, trying to persuade classmates to seize their chance to weigh in on issues that will affect them far beyond the next semester or next exam. “Our message is, it doesn’t matter who you vote for — just do it,” said Avalos, a fourth-year political science major. She is the director of BruinsVote, one of the many get-out-the-vote efforts underway across UC campuses. Student organizations are working to turn out record numbers of students in the upcoming midterm elections — and they are relying on everything from technology to peer pressure to help. As a generation, millennials and their younger Gen Z counterparts are now the largest chunk of the American electorate: If everyone from 18 to 34 voted, they’d have more power at the ballot box than any other age group. But there’s one big catch: They have to show up. Thus far, young voters, while great in number, are the age group that is least likely to vote. UC students are no exception. In the 2016 presidential election, only 4 out of 10 UC undergraduates who were eligible to vote did so. But the tide may be turning: A recent statewide poll found that more than 70 percent of young voters planned to participate in the midterm elections. A study by UC Santa Cruz researchers found that young people are actively engaged in advocating for causes they care about, from volunteering to holding protests and boycotting products. They just don’t necessarily connect those activities to voting, said sociology professor Veronica Terriquez, who co-authored the study. They often think their vote doesn’t matter, she said. And they don’t fully understand the electoral process. Students are taking both issues head on. The UC Student Association, through its UCweVote campaign, has created an online tool where students can register, get ballot information and pledge to vote. It is also looking to boost turnout on election day. Students who text “WE VOTE” to 562-850-1721 will receive a drumbeat of information and resources, such as their polling location and information about where they can drop off a mail-in ballot. The effort has set an ambitious goal of reaching 100,000 students, equivalent to half of all UC undergraduates who are eligible to vote. Students are also relying on peer pressure and a sense of friendly competition through efforts like Ballot Bowl, a new statewide contest to see which California university can register the greatest number of new voters. UC Berkeley’s “Bears to the Ballot” program will award $1,000 to the crew of campus volunteers that brings the most voters to the polls. The university itself is also working to ramp up student turnout, and has partnered with California Secretary of State Alex Padilla’s office on a pilot project that streamlines the student registration process and improves access to ballot information and polling locations. As part of that effort, UCLA this fall became the first campus in the nation to let students register to vote through the same portal they use to sign up for classes and conduct campus business. It has also consolidated polling places located throughout the campus to a central location at Ackerman Union. Beyond making the process easier, students are looking for ways to make sure their classmates actually make it to the ballot box on Nov. 6. Students have collected hundreds of pledges from their classmates to show up on Election Day, come what may. BruinsVote has taken the step of sending emails to every professor on campus, asking them to take Election Day into account when scheduling exams and project due dates. “We want to make sure students don’t have to choose between going to the polls and missing out on an important assignment,” said BruinsVote director Avalos. Perhaps most importantly, voting advocates are working to show their peers just how much their vote counts. If every UC undergraduate who was eligible to vote did so, their numbers would be as great as the entire city of Berkeley. And if students across the country followed suit, it could have an enormous impact, not only on the outcome of elections, but on the policies and issues being discussed. That difference helps explain why issues important to older adults, like Medicare and Social Security, get much more political attention that those typically top-of-mind for young people, like employment, housing and higher education, she said. Students also may not be aware of the many local issues on the ballot that directly affect them, such as propositions concerning housing. Local elections are the place where individual votes can have the most impact, addressing day-to-day issues like air quality and the management of schools. That’s what made the light bulb go off for UC Santa Cruz sociology major Kathy Delacruz Cerros, a student in Terriquez’s statistics class. As the child of immigrants and the first in her family to be eligible to vote, it took Delacruz Cerros a little bit of time to figure out the process. But once she did, she was surprised how many of the issues she cared about in her community were things she could influence at the ballot box. “These are things that affect us daily, that affect our loved ones, our friends and our peers, and if we don’t like it, we can do something about it,” Delacruz Cerros said. Story originally published by University of California.